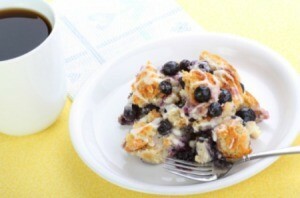 Your crockpot will allow you to make a delicious bread pudding that is easy to make and can cook while you are at work. This page contains slow cooker (crockpot) bread pudding recipes. If you like Raisin Bread Pudding and want a simple easy way to make great bread pudding you have to try this. In bowl whisk together the scalded milk, eggs, sugar, cinnamon, nutmeg, salt, vanilla and melted butter. Pour mixture over the bread cubes. Gently using a large spoon or spatula, press bread cubes down into mixture so all bread pieces will soak up milk mixture. Do not stir. Cover and cook on low setting for 5 to 6 hours until bread pudding is set. Serve with dessert sauce or whipped cream. Source: This is a recipe I found on About.com but I altered the bread from the French Bread they called for to the Sunmaid Raisen Bread with Cinnamon Swirl. I am looking for a Crockpot bread pudding recipe for Christmas. Can anyone help? Will this work with whole wheat bread? Thanks for the recipe. It looks really good, I will also use raisin bread. here is a recipe for the sauce for the bread pudding. 2 Tbsp. melted margarine 1 teas. van. Combine all ingred. in a sauce pan, cook and stir till thickened. Mix all ingredients together until bread cubes are thoroughly wet. Place mixture in a greased crockpot. Cook on HIGH for 3 to 4 hours, or until a knife stuck in middle of the pudding comes out clean. Adding one sliced of banana with the raisins makes it yummy!